The Trump Administration's proposed budget cuts advise eliminating community development block grants, which many of our country's Meals on Wheels programs rely on for support, placing our country's most vulnerable citizens at great risk. Meals On Wheels has provided a crucial service to Americans since it was initiated by a small group of compassionate Philadelphians in 1954. 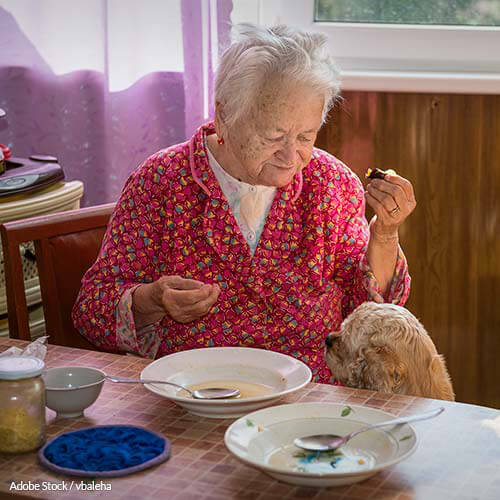 The program not only provides nutritious meals to the elderly and impoverished, as well as their animals, it helps them maintain the social connections that add safety and human comfort to their lives. Meals On Wheels attempts to feed the 10 million elderly Americans—that's one in six—who struggle with hunger in this country daily, as well as the 15.2 million living in isolation, and 18.4 million in or near poverty. The population of elderly citizens in the U.S. is expected to grow from around 60 million to over 112 million by 2050, making demand for Meals on Wheels services even greater. More than 2.4 million homebound seniors from 60 years old to over 100 are served by Meals on Wheels every year, and a large number will be left hungry and alone if the program is defunded. There are currently around 5,000 Meals on Wheels programs operating in the U.S., some which offer added benefits like pet food delivery, senior center meal programs, home repair services, and transportation. Younger generations may take those services for granted, but they lend a clinically proven lifeline to those who need it most. In a randomized test for Meals on Wheels America, a scientist from Brown University concluded that seniors gain mental and physical benefit from regular visits, possibly even keeping them out of the nursing home. "It's not just a meal, but a wellness check," Sandra Noe, executive director of Meals on Wheels of Northwest Indiana told USA Today. "That volunteer, that driver is able to tune into whether that person's health is failing, or if they've fallen or can't get out of their chair. And we're delivering relief from isolation, and were delivering relief to their family as well." The elimination of community block grants by way of a 16 percent cut to the Health and Human Services budget would not only burden communities already trying to fight poverty, it would make it impossible for some Meals on Wheels programs to continue operation. This myopic attempt at trimming the budget hurts those who need the most help of all. Sign to tell the Director of the Office of Management and Budget and President Trump to reconsider the proposed budget cuts and continue to fund community block grants and Meals on Wheels! The citizens of the United States have spoken, and we implore you to reconsider the proposed budget cuts to the Health and Human Services Department for 2018, specifically the community block grants that keep vital Meals on Wheels programs afloat. Meals On Wheels attempts to feed the 10 million elderly Americans who struggle with hunger in this country daily, as well as the 15.2 million living in isolation, and 18.4 million in or near poverty. The population of elderly citizens in the U.S. is expected to grow from around 60 million to over 112 million by 2050, making demand for Meals on Wheels services even greater. More than 2.4 million homebound Americans from 60 years old to over 100 are served by Meals on Wheels every year, and a large number will be left hungry and alone if the program is defunded. There are currently around 5,000 Meals on Wheels programs operating in the U.S., some which offer added benefits like pet food delivery, senior center meal programs, home repair services, and transportation. They lend a clinically proven lifeline to those who need it most. A scientist from Brown University recently found that seniors gain mental and physical benefit from regular visits, possibly even keeping them out of the nursing home. President Trump and Director Mulvaney, you of all people should understand the importance of supporting our senior citizens, as elected officials of a rapidly aging country. The idea of cutting support for Meals on Wheels is unjustifiable, and I demand you allow funding to community block grants to continue. That's 1,294 signatures! Let's keep the ball rolling.